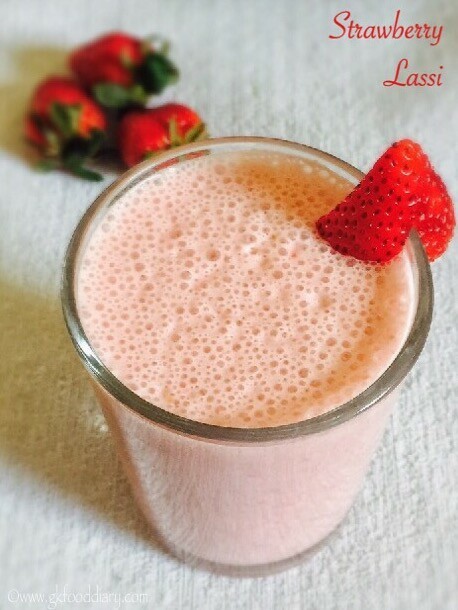 Strawberry lassi/strawberry smoothie is very refreshing especially during hot summers. 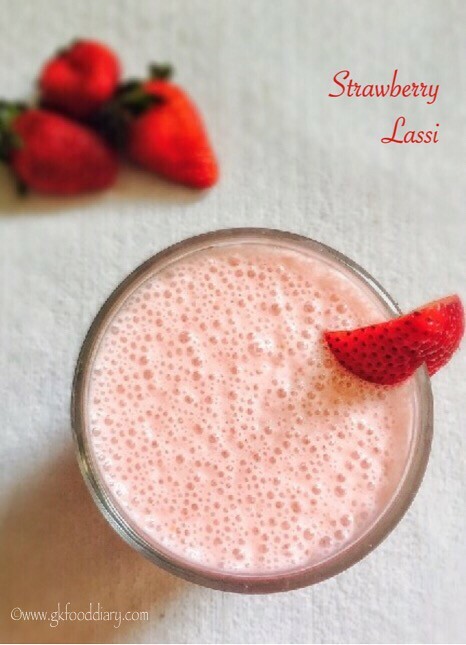 My little one loves strawberry and this strawberry lassi is no exception:) This creamy strawberry lassi is one of the easiest recipe to make with strawberries and ideal for babies from 10 months after introducing strawberries separate. Do Check out strawberry jam and strawberry milkshake recipes if you are looking for more strawberry recipes. 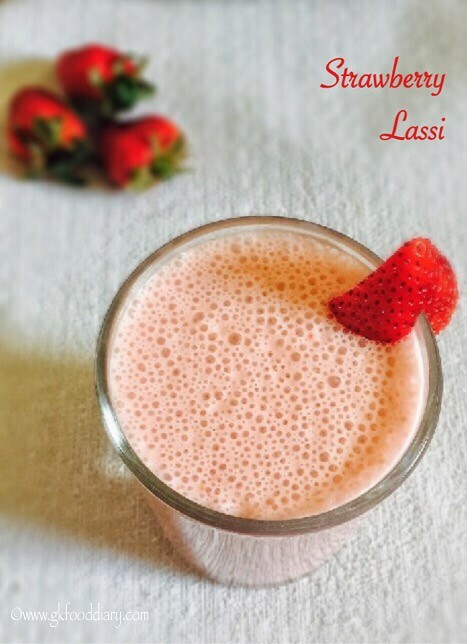 Here is how to make easy strawberry lassi for babies, toddlers and kids. Keep all the ingredients ready. Wash the strawberries in running water thoroughly. Remove the stems and slice them vertically. 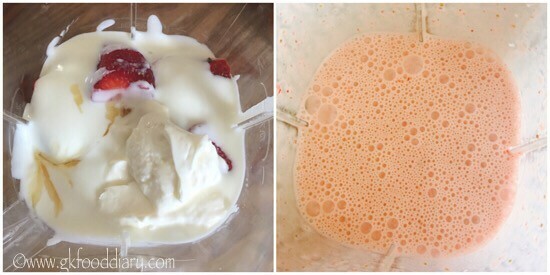 Then take the chopped strawberries, curd/yogurt, fresh cream and honey(if using) in a juicer/blender. Blend everything till smooth. 1. Keep all the ingredients ready. Wash the strawberries in running water thoroughly. Remove the stems and slice them vertically. 2. 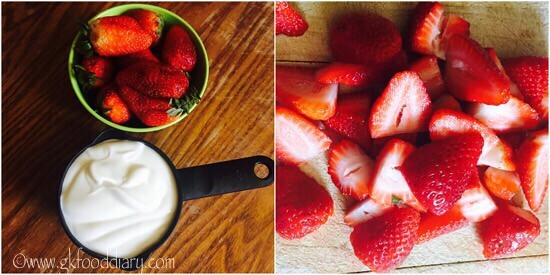 Then take the chopped strawberries, curd/yogurt, fresh cream and honey(if using) in a juicer/blender. Blend everything till smooth. The strawberry lassi is ready. Serve chilled !!! Wash the strawberries thoroughly before you proceed with the recipe. You could skip fresh cream and make this smoothie, but fresh cream gives a rich taste to this smoothie. 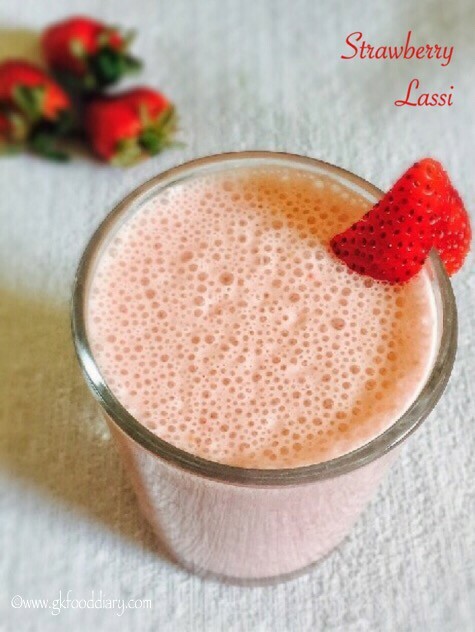 Make sure to introduce strawberries and curd/yogurt separate before you try this strawberry lassi. 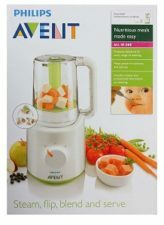 Skip honey/sugar for babies below one year.